The second multilateral meeting on “lethal autonomous weapons systems” by members of the 1980 Convention on Conventional Weapons (CCW) will be held at the United Nations (UN) Palais des Nations in Geneva on 13-17 April 2015. Ms. Mary Wareham, Campaign to Stop Killer Robots coordinator on expectations for the CCW meeting and way forward. The side event briefing will be held on Monday, 13 April at 13:00 in Conference Room XXIV. Other campaign side events for CCW delegates, including journalists, will be held on Tuesday, 14 April and Friday, 17 April in Conference Room XXIII. The 2015 CCW experts meeting on autonomous weapons will not be webcast, but @BanKillerRobots and campaigners will livetweet the formal proceedings using the hashtags #CCWUN and #KillerRobots. A total of 120 nations are ‘high contracting’ or state parties to the Convention on Conventional Weapons (CCW), including all five permanent members of the UN Security Council. This framework convention adopted in 1980 contains five separate protocols on various weapons and explosive remnants of war, including Protocol IV which preemptively banned blinding lasers before they were fielded or used and as such provides a relevant precedent for work to address fully autonomous weapons. The CCW also provided a useful incubator for efforts to address the humanitarian consequences of antipersonnel landmines in the 1990s and cluster munitions in the 2000s. Why is the CCW addressing killer robots? 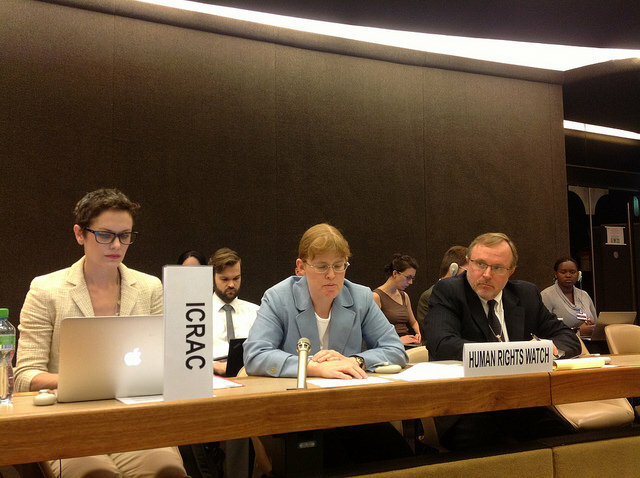 After the matter of “lethal autonomous robots” was first raised at the Human Rights Council in May 2013, nations agreed in November 2013 to a Convention on Conventional Weapons (CCW) discussion mandate to address questions relating to the emerging technology of “lethal autonomous weapons systems.” The decision was taken by consensus—a rare feat in today’s disarmament diplomacy—and came less than one year after non-governmental organizations created the Campaign to Stop Killer Robots calling for a preemptive ban on fully autonomous weapons. The CCW’s first “informal meeting of experts” held in May 2014 attracted strong interest. States again agreed again–by consensus–in November 2014 to continue the CCW deliberations on killer robots, scheduling a second “informal meeting of experts” on 13-17 April 2015. According to the annotated programme of work the 2015 meeting will focus on technical aspects of autonomous weapons including key characteristics, as well as legal considerations and overarching ethics and human rights issues. A “food for thought” working paper by the chair details key questions for delegations to address at the meeting. What does the campaign want the CCW to do on killer robots? Campaigners believe that the CCW’s agreement to consider the matter could lead to the creation of new international law prohibiting fully autonomous weapons. The Campaign to Stop Killer Robots supports continued CCW talks on autonomous weapons systems, but stresses that a long, drawn-out process that achieves a weak or no result must be avoided. The campaign urges a more ambitious mandate aimed at achieving an outcome, with more time set aside for substantive deliberations than just one week in the course of an entire year. The campaign has also called for the 2015 meeting to be genuinely inclusive, especially with the participation of women experts. Develop and articulate national policies on fully autonomous weapons in consultation with relevant actors, including civil society. Articulate the ways these weapons can be addressed at the international, regional, and national levels and become champions of the ban call. What happened at the first CCW meeting in May 2014? The 2014 experts meeting attracted representatives from 87 nations in addition to UN agencies, the International Committee of the Red Cross (ICRC) and the Campaign to Stop Killer Robots. During the meeting a few states delivered vague statements that appeared to seek to leave the door open for future technologies, but none openly said they are pursuing the development of fully autonomous weapons. No country vigorously defended or argued for the weapons, although Czech Republic and Israel each spoke on the desirability of such systems. There was no outcome document, but the meeting chair, Ambassador Jean-Hugues Simon-Michel of France, provided a report in his capacity, which noted the strong interest expressed in continuing the deliberations. What will happen at the April 2015 CCW meeting on killer robots? A similar number of states are expected to participate in the 2015 meeting as attended the first meeting in 2014, including all UN Security Council members. The main focus of attention will be the plenary sessions, which run in the morning (10:00-13:00) and afternoon (15:00-18:00) throughout the week. The Campaign to Stop Killer Robots is holding three side event briefings (13:00-14:30) to present civil society views and make the case for a preemptive ban on development, production, and use of fully autonomous weapons. According to the annotated programme of work issued in early March, the meeting will open on Monday, 13 April with a general exchange of views for delegations to highlight questions from the 2014 CCW experts meeting and share their positions on the development of national policy and legal provisions as well as “expectations regarding the international debate.” Some nations, including Cuba and Japan, have responded to the chair’s request to provide written views ahead of the meeting. Deliberations on technical issues are scheduled to take up the first two days of the 2015 meeting, followed by a half day on legal aspects, and a day on “overarching issues” including ethical, social, and human rights issues. Start times for the sequence of topics outlined in the programme of work could change as the week progresses. The technical sessions begins on Monday afternoon and Tuesday morning with a review of the state of play on research and development of autonomous weapons systems as well as an exchange on the military rationale for autonomous functions in weapons systems. Artificial intelligence expert Prof. Stuart Russell has agreed to speak on increasingly autonomous and complex functions and their use in weapon systems, now and in the future. The technical deliberations then turns on Tuesday afternoon and Wednesday morning to focus on “characteristics” or “elements” that can help to establish a common understanding of the defining aspects of concern for lethal autonomous weapons systems. Ms. Maya Brehm of Article 36, a campaign co-founder, will speak on the concept of “meaningful human control” of autonomous warfare. On Thursday, the so-called overarching issues are considered with a discussion list that includes ethical and social issues, human rights law issues, and “general security issues.” Ms. Bonnie Docherty of Human Rights Watch, a campaign co-founder, will speak on the human rights implications of autonomous weapons systems, including the basic tenants of the right to life, principle of humanity, and dictates of the public conscience or Marten’s Clause. An exploratory discussion on security will seek to address strategic and regional stability, relevance for asymmetric contexts, and the risks of proliferation. Friday morning will see a general exchange of views by delegations on areas for common ground following the week of deliberations in addition to the “framework for future debate.” Delegations are requested to provide their views on possible common ground on elements for a ban, restrictions, regulations, and code of conduct as well as on transparency. They should indicate their support for a continuation of a more ambitious CCW process. What’s the outcome of the 2015 CCW meeting? At the conclusion of the meeting, the chair will present a draft report on the meeting and seek input on the way forward. At the next annual CCW meeting on 13 November 2015 nations may renew the mandate to continue the experts’ discussions, possibly moving to a different phase of a more formal negotiating process. In December 2014, current CCW president Ambassador Remigiusz A. Henczel of Poland appointed Ambassador Michael Biontino of Germany to chair the 2015 CCW meeting on killer robots. Ambassador Biontino will likely recruit representatives to serve as “friends of the chair” for the various sessions, such as Ambassador Simon-Michel of France, chair of the 2014 CCW experts meeting on autonomous weapons. Sri Lanka’s Ambassador Ravinath Aryasinha from the Non-Aligned Movement (NAM) group will preside over the next annual CCW meeting, where on 13 November 2015 nations will take a decision on whether to continue deliberations on killer robots in 2016. At least 52 nations have made statements on this subject, but few to date have used those opportunities to discuss their own policy and practice in any detail, as the campaign’s separate compilation of country positions shows. The Campaign to Stop Killer Robots delegation to the CCW meeting of experts is comprised of 45 campaigners from 13 member NGOs in countries including Canada, Colombia, Egypt, Germany, the Netherlands, Switzerland, UK, and US. It includes key spokespersons Nobel Peace Laureate Ms. Jody Williams and roboticist Noel Sharkey. Following the precedent set by previous CCW meetings, the Campaign to Stop Killer Robots will take its seat at the table at every CCW session, as well as make statements, circulate documents, and host side events. See our Delegation List and the biographies of campaigners in the List of Side Events. Where are the women at the 2015 meeting? The 2014 CCW meeting had no female experts as presenters or speakers at the meeting, sparking criticism, an initiative to end all-male panels or “manpanels” and campaign bilaterals with the UN High Representative for Disarmament, Ms. Angela Kane. The 2015 meeting is a success in terms of gender diversity with a speaker line-up featuring experts Docherty and Brehm as well as Dr. Monika Chansoria, Prof. Sarah Knuckey, Ms. Elizabeth Quintana, Dr. Heather Roff, and Ms. Karolina Zawieska. Women comprise half of the Campaign to Stop Killer Robots 45-person delegation to the CCW meeting, including side event speakers.